Here is a step by step on how to make your own Easter Cross Card. A big thank you to Margaret Waters for this card design and step by step. Cut sheet of A4 card to length of 28cm. Score at 6, 11, 17 and 22cm (make short score lines at 11 and 17cm for reference). On each score line make light pencil marks at 6 and 11cm go back and complete scoring at 11 and 17cm leaving gap between pencil marks (5 columns). Using ruler and craft knife cut horizontally on 6cm marks across columns 2 and 4, repeat on 11cm marks. Cut vertically on two outermost score lines to create cross. 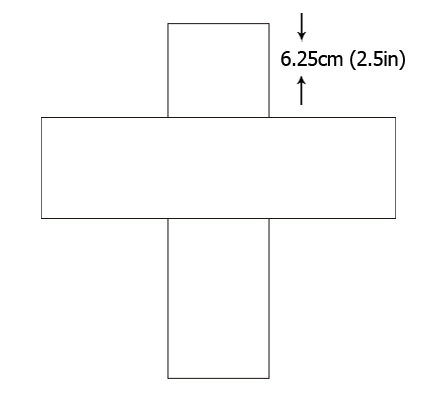 Cross – make template – vertical panel 22 x 5.5cm, horizontal 4.5 x 18cm (this will allow for adjustment) trim edges once in place.